The Abbe Museum will continue to offer free admission during select months in 2017, thanks to the generosity of Machias Savings Bank. Admission will be free February 2 - April 30 and November 1 - December 22, 2017. "This year, Machias Savings Bank and the Abbe Museum celebrate 26 years as partners," said Branch Manager, Matt Horton. "We are pleased to commemorate this partnership by once again sponsoring the Abbe's free admission program, which offers an opportunity for more visitors to see the Museum's exceptional exhibits, projects, and programs." As Maine’s first and only Smithsonian Affiliate, the Abbe’s free admission program aligns nicely with the Smithsonian’s goal of being easily accessible to the public, and it helps raise the Abbe’s statewide visibility as the only museum dedicated solely to sharing the story of the Wabanaki Nations. The Abbe staff is currently designing and installing two new exhibits, Twisted Path IV: Vital Signs and the 2017 Waponahki Student Art Show, both of which will open in April. In addition, the Museum’s new core exhibit, People of the First Light, is open and offers visitors a wide variety of content and perspectives around more than 12,000 years of history, conflict, adaptation, and survival in the Wabanaki homeland. The Abbe is currently open Thursdays through Saturdays, 10 am to 4 pm, through April 30, 2017. From May 1 through October 31, 2017, the Museum will be open seven days a week. The Abbe’s Acadia National Park location at Sieur de Monts Spring will be open seven days a week from mid-May to mid-October. Please visit abbemuseum.org for more details. Machias Savings Bank Branch Manager Matt Horton presents Abbe Museum President and CEO Cinnamon Catlin-Legutko with a check in support of the Abbe's free admission program. 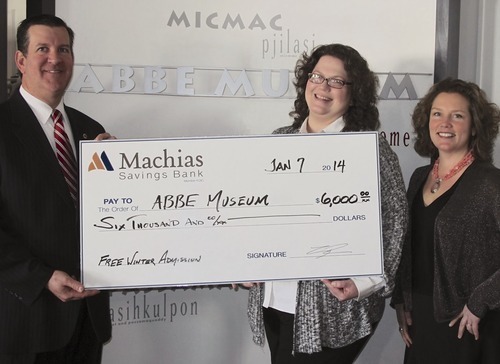 The Abbe Museum will continue to offer free admission in 2016, thanks to the generosity of Machias Savings Bank. Admission will be free on select days throughout the summer and fall, as well as from November through December. The Abbe anticipates a lot more traffic in 2016 due in part to the opening of their new core exhibit and it being Acadia’s centennial year. Offering free admission on key dates will give visitors something the Museum has never actually done before: free admittance on high profile, popular holidays. The Abbe is currently closed through the end of April 2016 while its new core exhibit is designed and installed in the Museum’s main gallery. The exhibit, People of the First Light, is the first large-scale permanent exhibit of its kind for the Abbe. The Abbe Museum is currently offering free admission during the 2015 winter months, thanks to the generosity of Machias Savings Bank. Admission will be free February 5, 2015 through April, and then again in November and December. Thanks to Machias Savings Bank’s support, for the first time in the Abbe’s 12 year history in downtown Bar Harbor, free admission was offered during the 2014 winter months. The impact of this program was palpable: the Museum experienced a marked increase in visitors from within the state of Maine over the course of 2014. In February 2011, the Abbe had 86 visitors from throughout Maine, while in February 2014, the Abbe had over 170 visitors from around Maine, a 97% increase. 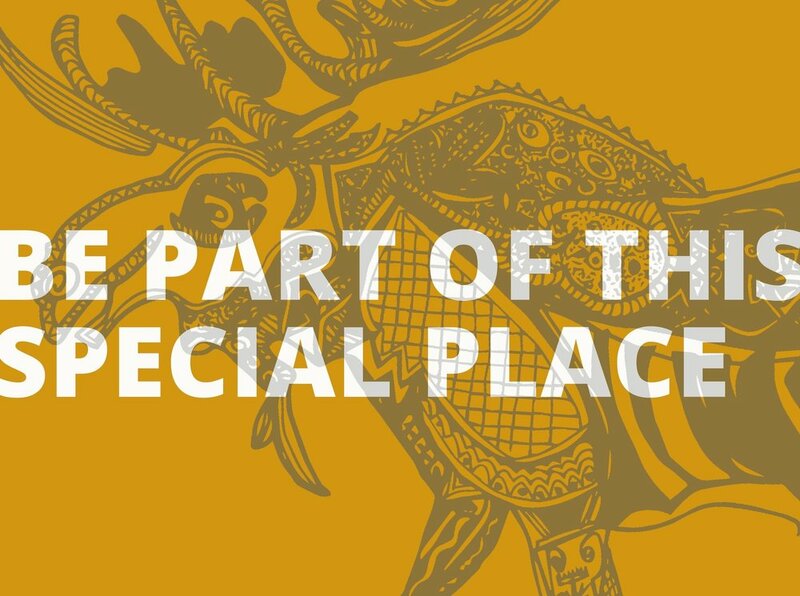 The free admission program helps raise the Abbe’s statewide visibility as the only museum dedicated solely to sharing the story of the Wabanaki Nations. As Maine’s first and only Smithsonian Affiliate, the Abbe believes that free admission in the winter aligns nicely with the Smithsonian’s goal of being easily accessible to the public. The Abbe is currently closed until February 5, 2015. Winter hours are Thursday through Saturday, 10 am to 4 pm. Breaking News! The Abbe Museum will be offering free admission half of the year beginning this February. The museum, which is celebrating its 86th year on Mount Desert Island, has a long-standing commitment to serving the local community, with much of the museum’s educational programs offered free of any additional charge after museum admission, and this year the Abbe is taking that commitment even further. The Abbe is currently closed for the month of January, as they take down last year’s feature exhibit, Wabanaki Guides and install the new feature exhibit, Twisted Path III, Questions of Balance.When the museum reopens on February 6, the doors will open to that new feature exhibit and admission will be free for all. Free admission begins February 6 through the end of April, and begins again November 1.